This is the first story in a bundle I got from Kindle, To the Stars and Back. It was good. Enough science to keep you interested and not feel too far fetched. The action was good and the characters, meh I didn't mind them. They were your usual assortment but with enough development to keep you engaged and be able to pick a favorite. The story starts out with our ship the Venture running from your typical bad guys and the human race trying to survive. 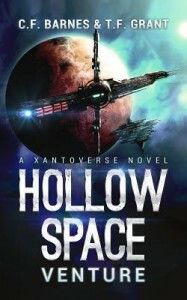 It was a quick easy story that plopped you in a new world, hollow space and how everyone from humans to plant types survive. I liked it enough to of course continue the rest of the set and keep an eye out on new stories. This wasn't a perfect story, the science was lacking and the plot never really explains why our main characters from the Venture ended up on the ship running from whatever alien was attacking, but there was enough that you weren't dragged down. It was a quick easy story that left you wanting a bit more so you have to go find the rest of the books or at least keep an eye out for more.